Both Manchester City and Manchester United have qualified for the knockout stages of the Champions League. City recovered twice from behind to force at 2-2 draw against Lyon in France, while United scraped together a 1-0 victory in the dying seconds to defeat BSC Young Boys at Old Trafford thanks to a late goal by Marouane Fellaini. Late goals are quite normal for United who sit fourth in the table when it comes to last-minute goals for and against in the Premier League. While Pep Guardiola was delighted in his side’s gritty performance, Jose Mourinho vented his anger at what he considered his side’s lacklustre display by kicking aside a set of water bottles, then picking up another set and hurling them to the ground. Yes, he was clearly angry, but this display of frustration also made him look rather petulant in front of the home crowd. Even a mild celebration at the victory, which after all sees the Red Devils progress to the next stage of the competition, would have sufficed. But, the outward showing of his undoubted frustration says much about the man’s temperament. The Swiss side BSC Young Boys were never thought too much of a threat. However, it took one of the best saves of his career from goalkeeper David De Gea in the 70th minute, to keep United from falling behind. It drew the only praise from the Portuguese who called his keeper world class. Although United didn’t show the flair we have come to expect from them in the past, they did show spirit. It was exactly what Mourinho had said his team lacked in their dull draw against Crystal Palace last weekend. However, this grit, while evident throughout the first half, ebbed away in the second period, despite the introduction of Romelu Lukaku, Juan Mata, and Paul Pogba. The win that wasn’t enough to lift Mourinho’s despairing mood. Instead of offering even meagre praise for the result, he preferred to wax lyrical about his past successes in Europe. The Manchester City manager, on the other hand, was full of praise for what he described as the huge personality his side showed. He even had praise for his opponents, saying that he was impressed by both their energy and their invention. He aired his view that French sides are all too often underrated when it comes to European competitions. Guardiola went on to say that French teams are physical as well as being fast, and skilful and that that is why their national side won the World Cup. With just nine minutes to go it looked as if City would go down to Lyon 2-1; the same score that they were on the wrong end of when the two sides first met in the competition at the Etihad. But an 83rd-minute goal from the dyed, blond haired head of Sergio Aguero saved the day. The difference between Manchester City and Manchester United is apparent. 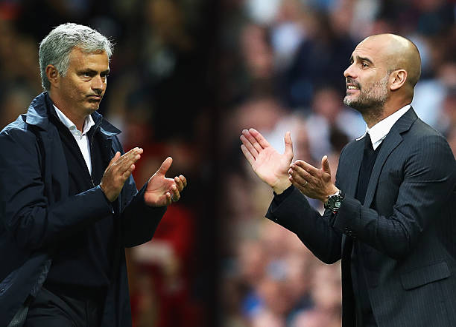 City are full of confidence and attacking flair, while United seem bogged down in a quagmire. The smiling countenance of Pep Guardiola and his positive outlook only serves to accentuate the bitter scowls of Mourinho and his doomsday, hangdog expression. It is exactly the sort of expression you would expect from a man heading for the gallows, and who knows? That could be precisely where "the Special One" will end up.